Our most popular prom choice is our photobooths, which are sure to provide some great memories from the night. Your guests simply grab some props, go in, start the booth and let the fun commence. Four photos are taken with enough time to change poses and within seconds the photos are printed out as one montage as a great keepsake from the night. We even upload them online with free downloads for your guests! Do your guests have a sweet tooth? Our selection of fun foods are a great add on too. 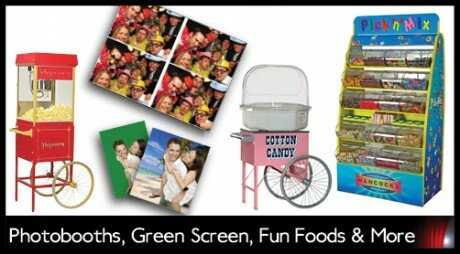 We can provide fully staffed traditional candy floss or popcorn carts. Or How about a pick ‘n’ mix stand for your event that can hold up to 60Kgs of sweets! Visit us online to see what else we offer including discounts for multiple services hired!